Abstract—The aim of this research is to investigate the effect of ambient air temperature on the steam generation. A parametric study was performed based on exergy analysis to study the impact of ambient air temperature on second law of efficiency, irreversibility and adiabatic flame temperature of steam generation. The results showed that at 25 percent excess air and with the range of ambient air temperature from 25 oC to 100 oC, the adiabatic flame temperature increases from 2015 oC to 2065 oC. Also the results showed that the second law efficiency and irreversibility ranges from 40.295% to 40.290% and 494.063 MJ to 494.161 MJ, respectively as the ambient air temperature increases from 25 oC to 100 oC. It is included that the ambient air temperature has a minimum impact on adiabatic flame temperature and insignificant impact on both the second law efficiency and irreversibility of overall steam generation. Also the combustion chamber and heat transfer sections of steam generation were studied by using exergy analysis. It was concluded that the ambient air temperature has a minimum impact on both combustion chamber and heat transfer sections. Index Terms—Exergy, ambient air temperature, irreversibility, second law efficiency, adiabatic flame temperature, excess air. Hadyan Fahad Alajmi is with Kuwait Oil Company, Kuwait (e-mail: halajmi@kockw.com). 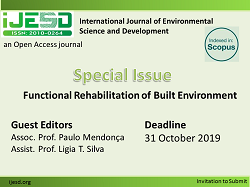 Cite: Hadyan Fahad Alajmi, "Effect of Ambient Air Temperature on the Performance of Steam Generator," International Journal of Environmental Science and Development vol. 8, no. 7, pp. 479-483, 2017.